Help Community Hope Project Change Lives! Community Hope Project hasn't added a story. 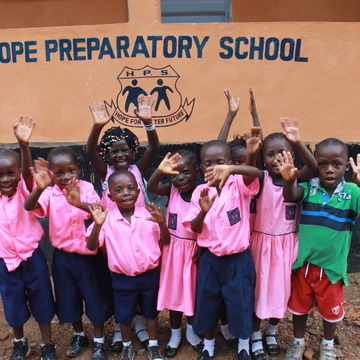 It is that time of year and our third trip to Sierra Leone rapidly approaches! As it draws near, we come to you, our faithful contributors, to ask for your help in continuing to grow and strengthen this community-based project in Hill Cut. The journey has been long and arduous, but also tremendously rewarding, for all involved (here and there!). We have reached so many of the goals we originally set forth thanks to you all, our wonderful supporters. We have built a solar powered school and community center, established income opportunities such as microloans, music rental set-up, and a phone charging station (all of which the community is now building upon to build an extension on the school), financed a community garden, given scholarships to those excelling in school and community involvement, brought water filtration systems to over 30 homes, installed hand washing stations, and overall, created a sense of HOPE and POSSIBILITY! Lives have improved, and continue to improve because of everyone's hard work and commitment! This trip we hope to continue to support previous economic and educational initiatives, and to inspire even greater community innovation, cohesion and social capital through Innovation Awards (described below). We are also looking to assess the impact of this project on both individuals and the community at large by conducting interviews with local households. Tackling significant challenges like poverty, injustice, and poor health requires hard work and commitment, and we graciously thank you for supporting this project. We are all helping to create a better world, and enriching our own lives in the process. INNOVATION GRANTS (Goal $1000-1500): These are meant to inspire community members to come up with creative projects that will improve the community, their own lives, and the lives of others in some way (promote health, community cohesion & support, generate income for further community projects, etc). Community members will propose ideas to a council of local elders and leaders and the most promising projects will be funded. We hope to award grants to 5-10 people at $100-$200 each, depending on the scale of the project (remember $1= $4,400Leones). EDUCATIONAL SCHOLARSHIPS (Goal: $1500): These are scholarships to help kids from the families with the least resources (some to young children just starting out, some for the more advanced students who have really proved their commitment and excellence). 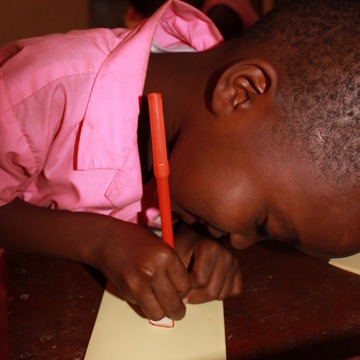 In Sierra Leone families have to pay for much of the cost of school, including books, uniforms, writing materials, activities, classroom supplies, lunches, etc. If you are interested in sponsoring a child for a year there are many opportunities to do so: $100 supports a child for a year of elementary school, $225 for middle school, $250 for high school, $500 for college. We can create a scholarship in your name, and also arrange for you to be in regular contact with your student, if you like. One hundred percent (100%) of your donation goes directly to the student and his/her family for educational support. These scholarships change lives. PILLAR AWARDS (Goal $500): These awards will honor those community members who have worked tirelessly and selflessly (frequently without remuneration, and sometimes at cost to themselves) over the past year to move this project forward. SUPPORT FOR NEW SCHOOL BUILDING (Goal $1000) . The Hill Cut community has aquired a loan on its own and expanded the school to a 2nd building! The structure and roof have already been completed (in the nick of time, before the heavy rains! ), but they need windows, a door, and furniture for the new students and teachers. We can finance all three if we can raise $1000. YEARLY LAND LEASE RENEWAL (for the community center & school): land is extremely limited and expensive in Freetown. A local landowner has been kind enough to let the community build the schools and is not charging a high amount, because he supports the cause. $300 covers the lease for a full year. SUPPORT FOR TEACHERS AND ADMINISTRATIVE SUPPORT (Goal $600): a tremendous amount of work goes into keeping the community center and schools going (from project coordination, to running the phone charging station and computer center, to school admin, to water filtration installation, to caretaking, cleaning, and teaching), and most people are doing it for next to nothing. As the community moves towards complete self-sufficiency, we are trying to augment the very low salaries so that those working on the project can have a livable wage. $600 would support salaries for two months. 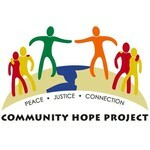 Community Hope Project hasn't posted any updates yet. 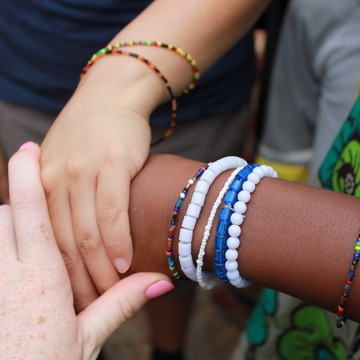 These bracelets are a symbolic token of appreciation, given to us from community members our first trip. Now, we will graciously provide one to you after our trip as a token of our gratitude! The school currently needs furniture inside the newly expanded building. This money can buy desks, chairs, chalkboards, or even doors! Help brighten the kid's futures and learning environment! Help make someones dreams come into reality. Where we can make human flourishing and innovation possible by rewarding creative ideas and community involvement! Get a personalized thank you card from the project leaders you support! Community Hope Project is managing the funds for this campaign.